The new Lipari 41 is a further refinement of the simple, strong, spacious craft this builder has always produced.The hull is built according to Fountaine Pajot’s long-established method with a Divinycell core above the waterline and solid laminate below. The stub keels are molded in as structural members and serve nicely as skids in shallow water. This simple, strong, shoal-draft design loses a bit of windward performance, but requires a lot less maintenance than a racier daggerboard boat. The company now uses a resin-infusion process to lay up the cored deck. The deck layout is standard for catamarans, with plenty of space for lounging and handling lines or ground tackle. The targa top allows easy access to the big boom, so stowing the mainsail in its stackpack is no problem. The helm seat is exposed, which means great visibility, but also full exposure to the sun. Book Lipari 41 and have a great sailing holidays in Greece. 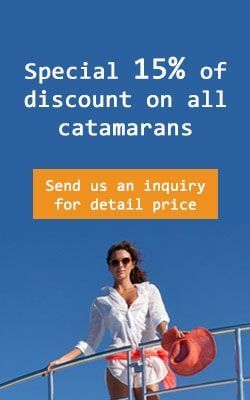 Charter catamaran Lipari 41 for rent in Greece and let us catapult you away for an unforgettable charter journey along the Greece islands from Athens, Lavrion, Mykonos, Lefkada but soon from all bases in Greece. Available for catamaran Crewed with our professional crew this all new sailing yacht can be rented for one way charters to and from Athens to Mykonos or Santorini as well as other famous islands subject to availability. Send us an Inquiry right now to secure top prime dates avoiding disappointment later or availability risks.